There was a time when it wasn’t acceptable to talk about holiday shopping until Thanksgiving. Then it was moved up to Halloween. Once costume season was over, gift-giving season could begin. But here it is, barely Columbus Day, and I’m touting Christmas and Chanukah gifts. Let me tell you why: Last week, I found out that the on-sale date for MWF Seeking BFF has been moved up. For the last year, I’ve thought I had to wait until January to share all my crazy friending misadventures with you. But not anymore. The new MWF Seeking BFF on-sale date is December 20, 2011! I’m excited about this for a couple of reasons. First, the book will be on shelves in less than three months! And even though I’m nervous, I’m mostly thrilled to see it out in the world. And potentially in a reader’s hands. Reason number two—the big reason—is that now MWF will be available for holiday gifts. Christmas, duh, is December 25. This year, Chanukah starts on December 20 and lasts through Dec 28. Perfecto. And while, yes, perhaps I am a little biased…I really think MWF Seeking BFF could make a great holiday gift for your own BFF. I hope you’ll all forgive this shamelessly self-promotional post, but (nerdy as this sounds), when I get book news this is the first place I want to share it. You’ve all been so supportive of my quest so far, and plenty of you lived through it with me (both virtually and in real life). If a funny ode to modern-day friendship, in the form of one locally friendless lady’s sometimes awkward and sometimes heartwarming memoir, sounds like the perfect gift for your BFF, you can pre-order the book today. It should arrive on your doorstep on December 20. Just in time to get wrapped up and put under the tree. Or next to the menorah. And you’ll actually be doing double gift duty. Because you’ll be buying your BFF a gift, and you’ll be buying me a gift, too. (Who, me? You shouldn’t have!) Pre-orders are especially helpful because they contribute to a book’s first week of sales, which is the most important week. So if you wanted to grab a copy for yourself, or your BFF, or your circle of eight BFFs, I would be forever grateful. Forever and ever. And if you don’t… well I’m still grateful. Because you are here, reading this. So thank you, as always, for tuning in and supporting my project. 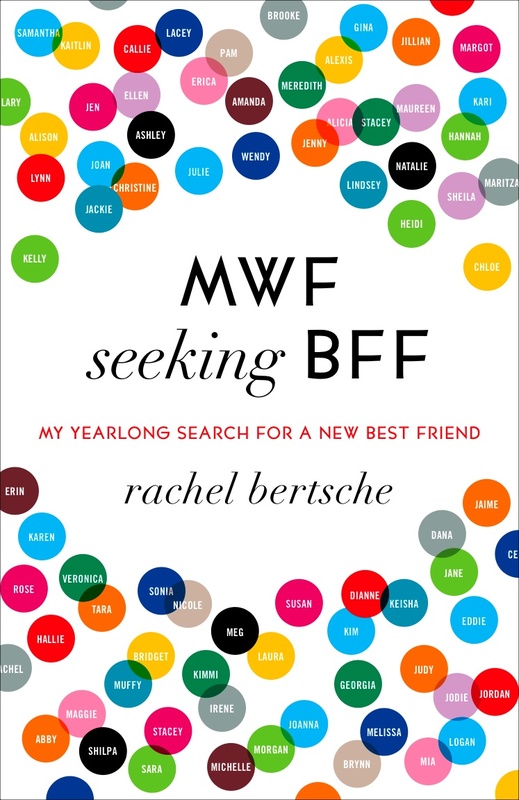 If you are thinking of gifting someone with MWF Seeking BFF, I’d love to hear who the recipient might be. A budding new pal? A lifelong bestie? Originally, I was going to ask for this as a birthday present, since my birthday is January 24, but now I can ask for it for a Christmas present and that makes me so so so so so so happy! Thank you Elise! I so appreciate you getting your hands on a copy in any way you can! Thanks Nmaha! And yes, Christmas is going to be big this year… a double whammy for sure! I checked my email this morning and amazon sent me a message telling me your book was coming early!!! I ordered one for me and one for my best friend who I have known my whole life months ago! I am most excited to get it before Christmas. And how exciting for you! i can’t wait to read it!!! Thank you Virginia! I can’t tell you how much I appreciate that. I hope you AND your BFF love it! Woo hoo! I may be giving the book to a BFF or two – and of course I was already planning on buying a copy for myself. 🙂 So exciting! Congrats! It’s in time for my birthday this year. 🙂 I’m looking forward to reading it.. This is such exciting news for you! I’m sure more copies will be sold right off the bat. Just finished my order on Amazon. I can’t wait to read the book over the holidays. My niece has already read an advanced copy (wonder who she knew) and loved it! What a perfect addition to anyone’s book shelf. Thank you SO MUCH for ordering it! I so appreciate it. And, yes, that niece of yours… she must have SOME in! Very exciting to hear! I am getting a copy for myself and a copy for a friend who just moved from one state to another state. (Unfortunately, I don’t live in either of those states.) It was going to be a belated birthday gift since her birthday is in early January, but now it’ll be an early gift. It’s a perfect gift too since she has been lamenting the fact that she has to make new friends all over again. Thanks and congrats! Thank you so much Jean! I hope your friend with all the moving is having an ok time with the whole new friends thing. I hope you both love the book! WOOO! Book release on my birthday. Our home has already pre-ordered two copies, duh. Uh, that was me. Not “anonymous.” Basically, I don’t read fields correctly on Fridays. Thanks Lisa! You rock. Obvs. I pre-ordered your book a couple of months ago… can’t wait! I also love how my name, well one syllable, is on the cover! Haha, thanks Jenna! I appreciate that so much. Congrats Rachel! Now time to pre-order your book. So exciting and awesome. High five BFF (“Bloggy Friend Forever”)!